The 2020 presidential selection process is already underway. As the political parties finalize their nominating rules and the states jostle for an advantageous contest date, potential challengers are being identified and sized up by party insiders. Once again, media and popular attention will be disproportionately focused on the candidates’ performance in the first and earliest of the state nominating contests—and on how quickly the sequence of primaries and caucuses winnows the field and identifies the presumptive nominees. But what are the implications of a sequential and front-loaded nominating calendar that gives some voters outsized influence while leaving many others with a constrained choice—or no choice—in the selection of their party’s presidential nominee? 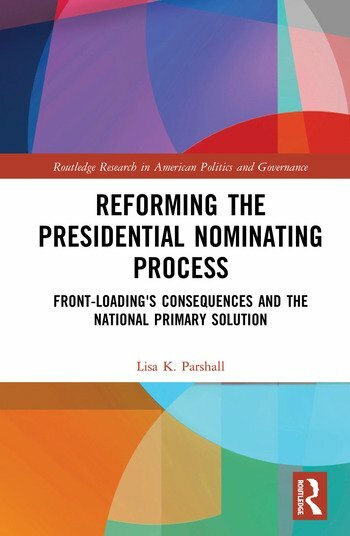 Lisa K. Parshall is an Associate Professor of Political Science at Daemen College in Amherst, New York, specializing in American Politics, Public Law, and Public Policy. She has served as an officer for the New York State and Northeastern Political Science Associations, as an Advisor for Vote Smart, and is a Richard P. Nathan Public Policy Fellow at the Rockefeller Institute of Government in Albany, New York (2018–2019).